Children around the world with egg allergies, particularly in resource-poor areas, don't have a lot of options. But Eating Eggless contains a simple eight-step guide to eating and living the eggless way, a resource section, and a list of alternative names for eggs and where they can be found in your food. With the remastered classics in this cookbook, your kids and you will never again need to pass up your favorite dishes or worry that eggs have snuck their way into your children's food. 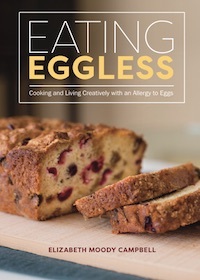 Whether you're a baking savant or a kitchen novice, food safety advocate Elizabeth Moody Campbell makes eating eggless both possible and pleasurable.